In 2007 The National Trust for Historic Preservation declared Brooklyn's industrial waterfront one of the top eleven most endangered sites, so I thought that it would be interesting to see what has been lost so far. The aerial diagram shown here illustrates what has been erased from the North Brooklyn Waterfront since 1994. I generated this graphic by comparing two aerial photos. The older 1994 aerial was a lower resolution and not always easy to read, so this graphic is not one hundred percent accurate; however, it is a good approximation of where buildings have been removed for new development. I am not showing this illustration to argue that none of these buildings should have been removed. Not all buildings have the same level of historic value and some of the buildings that were removed were replaced by parks instead of condos; although, the majority of demolished buildings were replaced by condos or are vacant lots awaiting their condofication. 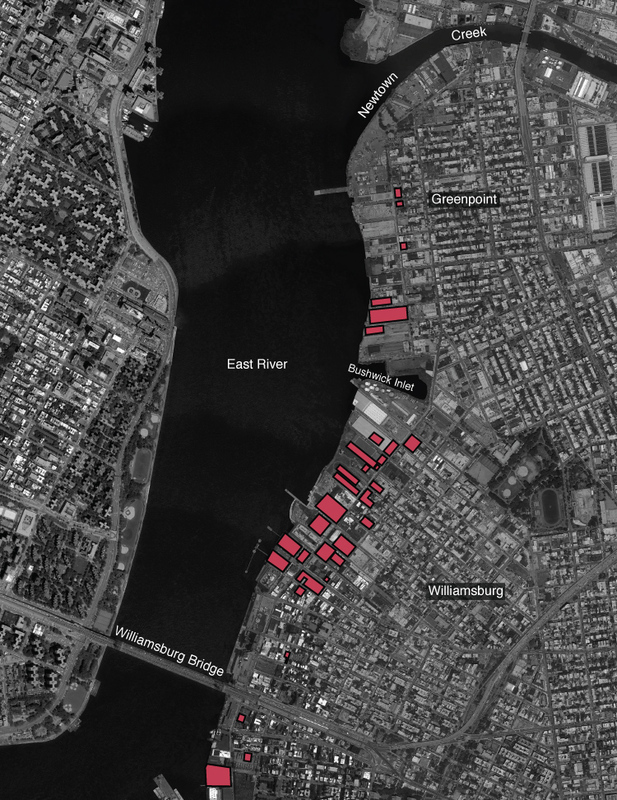 Also, many of the buildings that have been removed, like some of the Greenpoint Market Terminal buildings were significant cultural structures and If current plans for the Brooklyn Waterfront come to fruition, the quantity of red blocks on this map will will continue to expand and the historic and cultural integrity of the neighborhood will continue to diminish.